Jeanna Bryner explains that much of what we don't understand about being human is simply in our heads. The brain is a befuddling organ, as are the very questions of life and death, consciousness, sleep, and much more. Here's a heads-up on what's known and what's not understood about your noggin. If you were to ask 10 people what dreams are made of, you'd probably get 10 different answers. That's because scientists are still unraveling this mystery. One possibility: Dreaming exercises brain by stimulating the trafficking of synapses between brain cells. Another theory is that people dream about tasks and emotions that they didn't take care of during the day, and that the process can help solidify thoughts and memories. In general, scientists agree that dreaming happens during your deepest sleep, called Rapid Eye Movement (REM). Fruit flies do it. Tigers do it. And humans can't seem to get enough of it. No, not that. We're talking about shut-eye, so crucial we spend more than a quarter of our lives at it. Yet the underlying reasons for sleep remain as puzzling as a rambling dream. One thing scientists do know: Sleep is crucial for survival in mammals. Extended sleeplessness can lead to mood swings, hallucination, and in extreme cases, death. There are two states of sleep-non-rapid eye movement (NREM), during which the brain exhibits low metabolic activity, and rapid eye movement (REM), during which the brain is very active. Some scientists think NREM sleep gives your body a break, and in turn conserves energy, similar to hibernation. REM sleep could help to organize memories. However, this idea isn't proven, and dreams during REM sleep don't always correlate with memories. It's estimated that about 80 percent of amputees experience sensations, including warmth, itching, pressure and pain, coming from the missing limb. People who experience this phenomenon, known as "phantom limb," feel sensations as if the missing limb were part of their bodies. One explanation says that the nerves area where the limb severed create new connections to the spinal cord and continue to send signals to the brain as if the missing limb was still there. Another possibility is that the brain is "hard-wired" to operate as if the body were fully intact-meaning the brain holds a blueprint of the body with all parts attached. Residing in the hypothalamus of the brain, the suprachiasmatic nucleus, or biological clock, programs the body to follow a 24-hour rhythm. The most evident effect of circadian rhythm is the sleep-wake cycle, but the biological clock also impacts digestion, body temperature, blood pressure, and hormone production. Researchers have found that light intensity can adjust the clock forward or backward by regulating the hormone melatonin. The latest debate is whether or not melatonin supplements could help prevent jet lag-the drowsy, achy feeling you get when "jetting" across time zones. Some experiences are hard to forget, like perhaps your first kiss. But how does a person hold onto these personal movies? Using brain-imaging techniques, scientists are unraveling the mechanism responsible for creating and storing memories. They are finding that the hippocampus, within the brain's gray matter, could act as a memory box. But this storage area isn't so discriminatory. 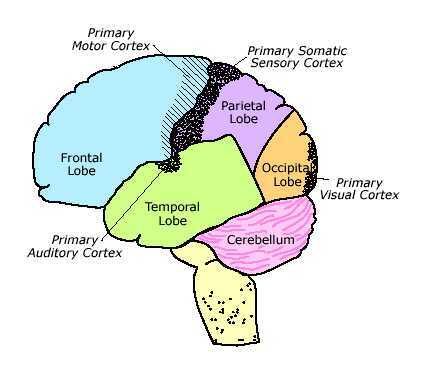 It turns out that both true and false memories activate similar brain regions. To pull out the real memory, some researchers ask a subject to recall the memory in context, something that's much more difficult when the event didn't actually occur. Laughter is one of the least understood of human behaviors. Scientists have found that during a good laugh three parts of the brain light up: a thinking part that helps you get the joke, a movement area that tells your muscles to move, and an emotional region that elicits the "giddy" feeling. But it remains unknown why one person laughs at your brother's foolish jokes while another chuckles while watching a horror movie. John Morreall, who is a pioneer of humor research at the College of William and Mary, has found that laughter is a playful response to incongruities-stories that disobey conventional expectations. Others in the humor field point to laughter as a way of signaling to another person that this action is meant "in fun." One thing is clear: Laughter makes us feel better. In the long-running battle of whether our thoughts and personalities are controlled by genes or environment, scientists are building a convincing body of evidence that it could be either or both! The ability to study individual genes points to many human traits that we have little control over, yet in many realms, peer pressure or upbringing has been shown heavily influence who we are and what we do. Living forever is just for Hollywood. But why do humans age? You are born with a robust toolbox full of mechanisms to fight disease and injury, which you might think should arm you against stiff joints and other ailments. But as we age, the body's repair mechanisms get out of shape. In effect, your resilience to physical injury and stress declines. Theories for why people age can be divided into two categories: 1) Like other human characteristics, aging could just be a part of human genetics and is somehow beneficial. 2) In the less optimistic view, aging has no purpose and results from cellular damage that occurs over a person's lifetime. A handful of researchers, however, think science will ultimately delay aging at least long enough to double life spans. Living forever may not be a reality. But a pioneering field called cryonics could give some people two lives. Cryonics centers like Alcor Life Extension Foundation, in Arizona, store posthumous bodies in vats filled with liquid nitrogen at bone-chilling temperatures of minus 320 degrees Fahrenheit (78 Kelvin). The idea is that a person who dies from a presently incurable disease could be thawed and revived in the future when a cure has been found. The body of the late baseball legend Ted Williams is stored in one of Alcor's freezers. Like the other human popsicles, Williams is positioned head down. That way, if there were ever a leak in the tank, the brain would stay submerged in the cold liquid. Not one of the cryopreserved bodies has been revived, because that technology doesn't exist. For one, if the body isn't thawed at exactly the right temperature, the person's cells could turn to ice and blast into pieces. When you wake up in the morning, you might perceive that the Sun is just rising, hear a few birds chirping, and maybe even feel a flash of happiness as the fresh morning air hits your face. In other words, you are conscious. This complex topic has plagued the scientific community since antiquity. Only recently have neuroscientists considered consciousness a realistic research topic. The greatest brainteaser in this field has been to explain how processes in the brain give rise to subjective experiences. So far, scientists have managed to develop a great list of questions. Found the following animated image file. Continental Finance Credit Card, issued by First Bank of Delaware, Wilmington, Delaware is one of the worst credit cards targeted on sub prime borrowers across the globe. Don't believe me? See the details for yourself. Below are the rates, fees and terms associated with this credit card offer. Internet payment fee: $4 for each authorized Internet payment. professed his desire to become a great writer. scream, cry, howl in pain and anger!"